Eeep! 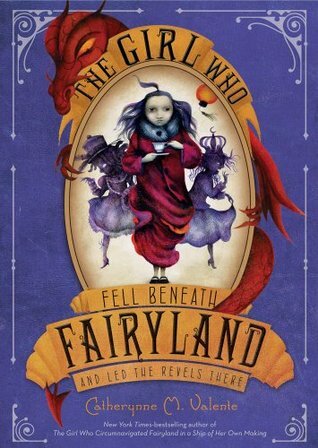 I'm going to be reviewing The Girl Who Circumnavigated Fairyland in a Ship of Her Own Making in a few days here on FTF, but when I came across this earlier this week, I knew I wanted to work it in as soon as possible and make sure it got a Fairy Tale Fortnight mention. Anyone else eagerly awaiting the chance to see what became of September's shadow? Oh - AND IT'S PURPLE. September returns to Fairyland to reunite with A-Through-L, Saturday, and Gleam, and to confront her shadow-self, who has become the queen of Fairyland-Below, the upside-down world beneath the Fairyland of the first novel, filled with creatures of water and shadow, tales of ancient Fairyland before the human world was born, and not a few hungry buffins, blind birds of ice and moonlight. The yearly revels of Fairyland-Below climax in a mysterious rite September must avert or else lose her shadow forever. I'm very anxiously awaiting it. I love that Fairyland-Below is upside-down. How could it not be upside-down. I picked up a couple of her other books too and I'm anxious to get to them. Thanks for another great rec!!! I LOVE this cover!!!! And furthermore, I want this book yesterday! Ahhh. YES! I am SO excited for this one, in fact, I'm hoping I'll like it better than the first because it seems as if it'll have a bit of a darker feel. Not that the first was all sunshine and rainbows, but I'm excited about the shadows...also LOVE the cover.